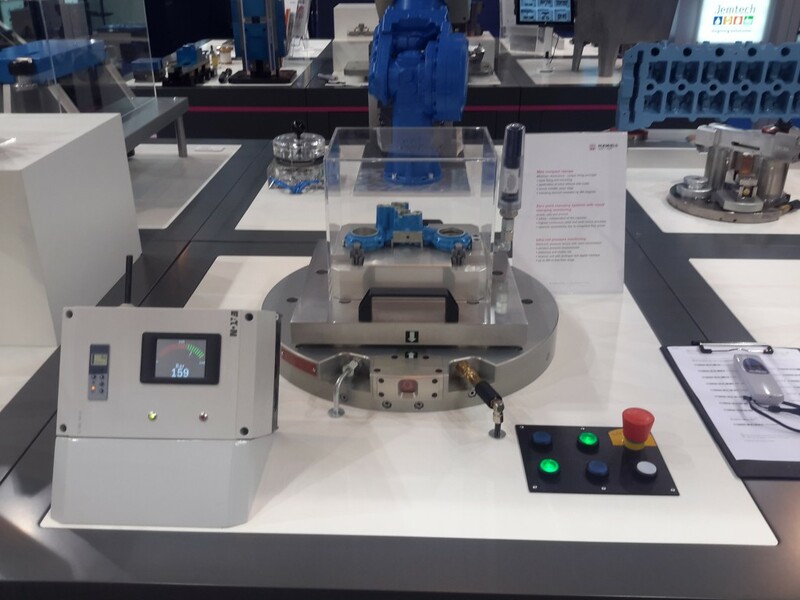 As a key innovator in Industry 4.0, Roemheld offers a wide range of products designed to support a ‘smart factory’ environment. These tackle the challenges companies face when looking to increase automation within the manufacturing process. 5-Axis clamping can present particular challenges and so Roemheld has developed an electronic wireless pressure sensor. This offers stationary and mobile measurement of rotating or hard-to-reach sections of hydraulic clamping fixtures. Designed for use with automatic manufacturing systems, transfer lines, assembly lines and rotary indexing fixtures and tables, up to 16 pressure sensors can be individually configured and monitored from a single receiver. Ideal for applications where wired connections are impractical or too expensive, the wireless electronic pressure sensor uses radio transmission with a free-field indoor range of up to 300m and an outdoor range of 60m. The wireless electronic pressure sensor enables the pressure of single or multiple points to be checked simultaneously during start-up and maintenance with minimum installation costs. The electronic wireless pressure sensor proved key to a research project that Roemheld collaborated on with the Manufacturing Technology Centre, based in the Midlands. The project involved running tests to measure the effects of centrifugal forces on hydraulic fixtures. So being able to use a wireless pressure sensor to monitor multiple, moving sections at the same time was extremely advantageous. Scanning frequency is 0.5 – 20 seconds so pressure drops in hydraulic clamping fixtures could be identified in real time, helping to avoid tool breakage and resulting machine damage. Easy-to-install modules of battery-operated electronic pressure sensors have a radio transmission and a receiver unit. This enables pressures of up to 250 and 500 bars to be transmitted to machines and monitored at a distance of 300 meters from up to 16 fixtures. Roemheld is a leading innovator within Industry 4.0, having already developed a range of electromechanical tension elements including electric swing clamps. These are already in use in applications where hydraulics are not suitable. 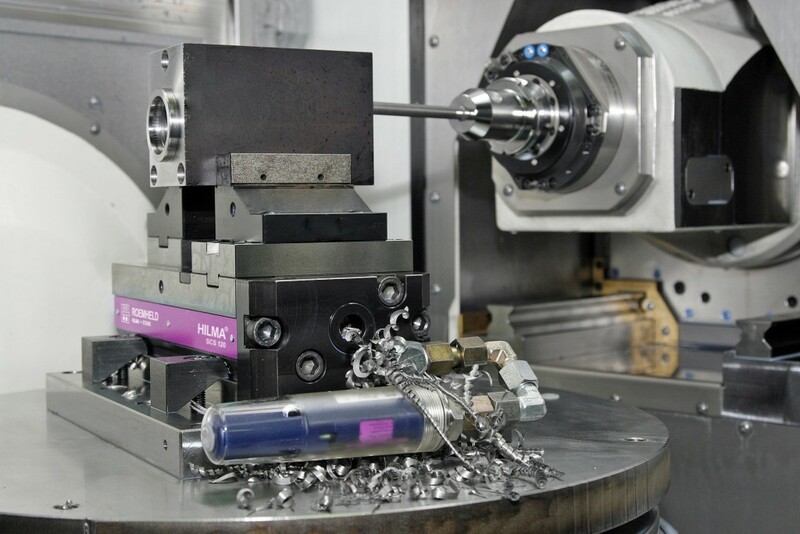 The company is also working on developing intelligent clamping systems that enable the actual workpiece to be monitored rather than just obtaining data from the spindle. Terry O’Neill, Managing Director of Roemheld (UK) Limited, said: “As a manufacturer of workholding products, Roemheld invests heavily in researching and designing technological innovations that are driven by customer need. We use our own products within our own manufacturing processes so we understand the changing demands of the marketplace. The wireless electronic pressure sensor is just one of Roemheld’s many innovative electric products designed to support customers in their move towards the demands of Industry 4.0”.